Who Else Wants to Sign-Up 100 Reps in 3 Days? "Discover How a Non-Techie Mother of 2 went from Dead Broke to Multi 6-Fig Business Owner FAST, and How You Can Too!" From the desk of: The "Original Attraction Marketer"
You want the Financial Freedom you were promised when you first joined your primary business. You want top-earner status, global recognition, and to be speaking on stage at your company events. You want the ability to write your own paycheck, call the shots, and NEVER have to work a J.O.B. again. I'm talking about the ability to strike at will and print money whenever you want with whatever affiliate program, business opportunity, or MLM company you wish to promote. How am I so sure that I can help you achieve what may seem like the impossible? Because I've been in this industry since 1999, and quite possibly just like you I struggled immensely in the beginning. I was broke, burnt-out, and tired after 2 years of begging my friends and family to join my business. Shopping malls, cold calls, home meetings, stalking people at bookstores and gas stations, annoying my friends and family, you name it and I probably did it with VERY little to show for it. It got so bad in fact that I started not getting invites to family BBQ's because they were tired of me pitching, begging, and shoving my business down their throats every chance I got! And then in 2001 EVERYTHING changed for me because I was introduced to the term "Attraction Marketing," and it changed my entire world (and it's about to change yours). Since 2001 and because of what I now know about "Attraction Marketing,"
Imagine spending 8 weeks under my guidance where you and I achieve ONE goal together: You will become a lead magnet and top recruiter without ever having to chase a single person again... EVER! Give me 8 weeks and I promise I'll give you your life back. Here's the curriculum that we are going to go through in addition to special bonus lessons and modules along with 15 recorded Q&A sessions to make sure you stay on track. These recorded modules were designed to be consumed 1 module per week so that you MASTER the material. 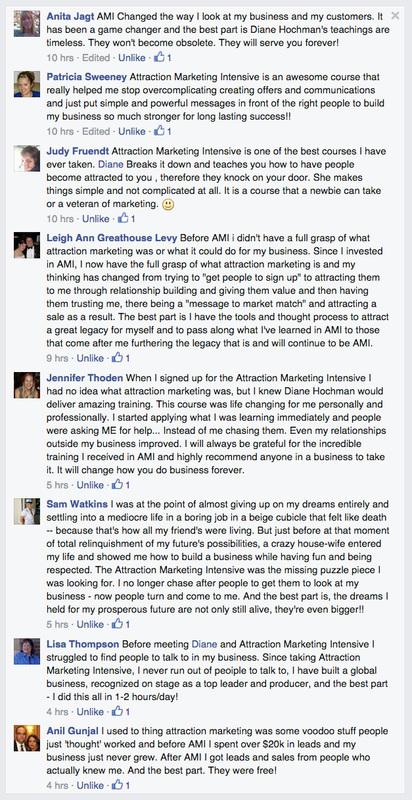 If you are a go-getter, you could get through 'Attraction Marketing Intensive' in a day or 2... that choice is yours. What You Get with "Attraction Marketing Intensive"
Module 1: Just What Is Attraction Marketing Anyway? Let me help you wrap your head around this concept and prove that you ALREADY know all you need to know about this kind of marketing to create an incredible business that flourishes and profits 24x7 even in your sleep. Secrets to create unlimited cash-flow that will propel your business to higher and higher levels thanks to the incredible income-producing power of the "Funded Proposal." Learn how to create an extremely effective marketing story just like the 7-Figure Pros (YES, I guarantee you have a powerful story that will inspire the masses and move mountains... I'll prove it to you! ), and then uncover how to apply your story to ALL of your social media profiles and blogs across the internet. Learn the fundamentals of creating laser-focused video that locks people like moths to the light, and gets people to take the action you want them to take... i.e., BUY YOUR STUFF and JOIN YOUR BUSINESS. Warning: be careful because this week's training will create a loyal fan base that will love and follow you forever. Discover my personal, proven, persuasive headlines and e-mail copy that will make your prospects BEG to buy from you faster than a kid begging for an ice cream on a hot summer day. Take all you have learned, let it LOOSE on the social media platforms, and watch your business go WILD. I will unveil my social media scientific formula that works 24x7 to gain more fans, more exposure, more reps, and more cash 24x7! IRRESISTIBLE BONUSESto make you want to BUY NOW! Sure...everybody tells their story in our industry, but very few have crafted an IN DEPTH NARRATIVE that sets them apart from all other marketers in the space. 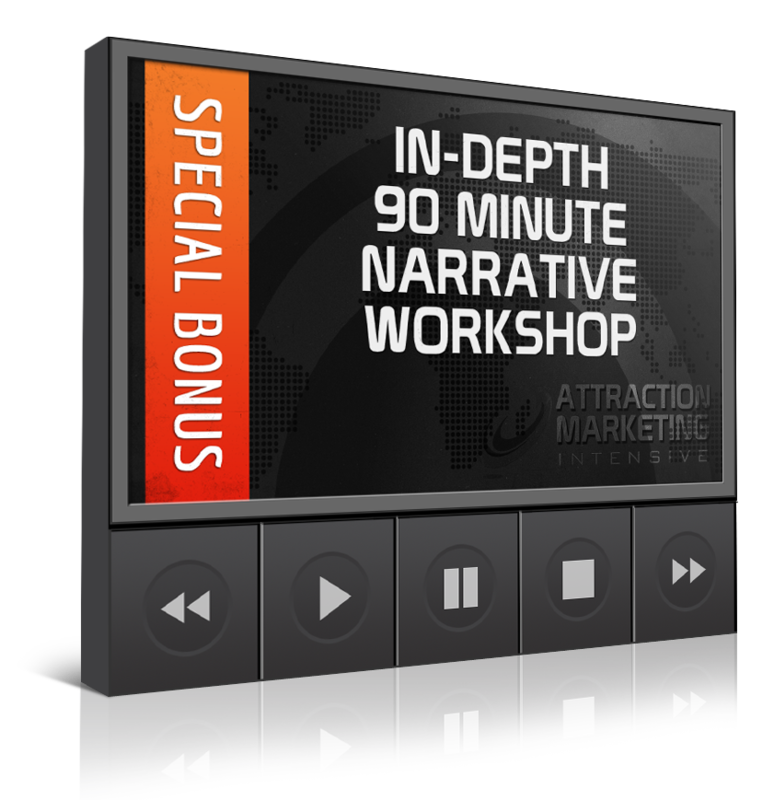 In this invaluable 90 minute workshop you will learn The 8 Components of a Compelling Narrative so you can CRAFT YOUR STORY in a way that Makes You Irresistible To Your Prospects. When you get this right you will NEVER be broke, and financial abundance will flood your bank account faster than an avalanche crashing down Mt Everest. Discover the 4 types of income you MUST have in your business in order to build a rock-solid foundation to build on. Most people are working with only one or 2 types of income, which makes their business volatile and vulnerable to collapse. Without fully understanding and embracing what this workshop covers in depth, you are essentially building the foundation of your business on a deck of cards that may topple with any given gust of wind. 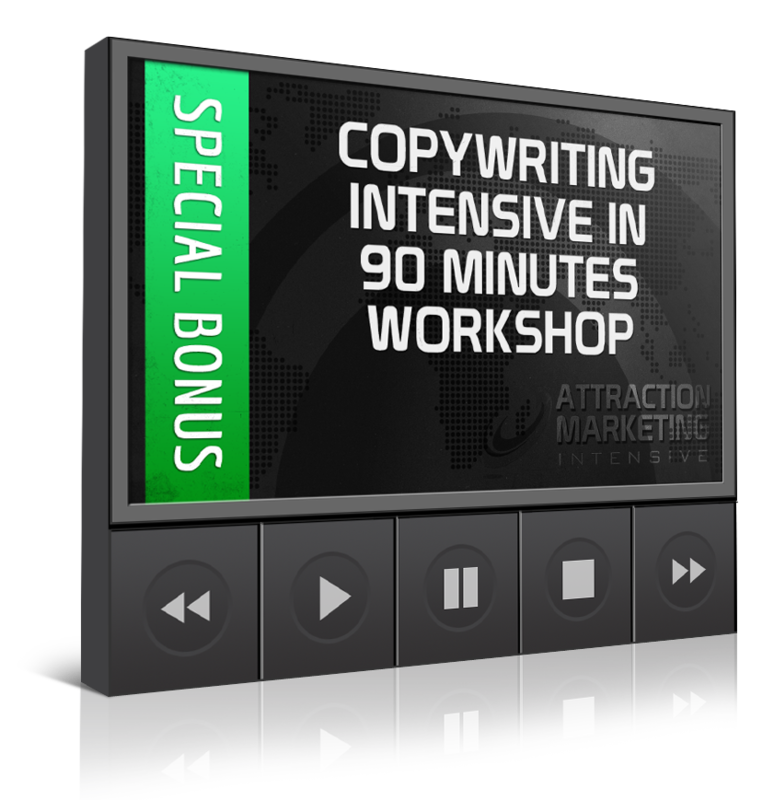 This bonus session is on writing copy that attracts and sells like crazy. This IS one of the most critical (and profitable) skill-sets you could ever master because when you understand how to persuade people with your words, you can make sales with e-mails, videos, blog posts, articles, ANYTHING 24x7 even while you sleep. Mastering the art of persuasive copywriting is how you make a solid living long-term online, period. You will learn about the concepts of polarization, size and number, story telling, and SO MUCH MORE in this 90 minute workshop. Keep in mind that I can and have charged as much as $1,000 PER HOUR of my time, and inside 'Attraction Marketing Intensive' you are getting 8 FULL length pre-recorded modules, 15 recorded Q&A sessions to make sure you IMPLEMENT & Take Action, and 3 incredible bonuses to all but guarantee you GET RESULTS & MAKE MONEY IN YOUR BUSINESS STARTING TODAY! This is EVERYTHING I know about embracing 'ATTRACTION MARKETING' to build a multiple 6-Figure Business online in an easy-to-follow format. YES! 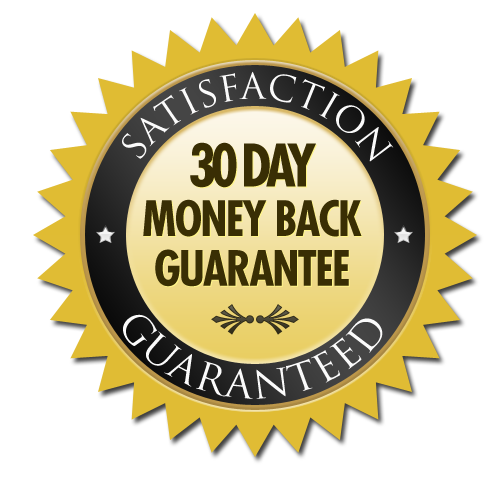 You get a 30-day No Questions Asked Money Back Guarantee! YES! You get INSTANT ACCESS to this recorded intensive when you BUY NOW! My promise to you: simply consume and IMPLEMENT 1 recorded module per week for the next 8 weeks, and I PROMISE I'll give you your life back. That's just 8 solid weeks of all-out FOCUS for the rest of your life to radically transform your business, and you can count on me to be there every step of the way. This proven blueprint has been battle tested, and has created success stories over and over again, year after year... And now it can be YOURS for a fraction of the cost! It simply comes down to how badly do you want it, AND your ability to make ONE simple decision. Because success is literally knocking at your doorstep. The only question is, Do you have the courage to step through it, or are you waiting until next year to finally see results in your business? I know you possess the passion, courage, and vision to achieve that ultimate dream lifestyle, and finally give your family the life they deserve. 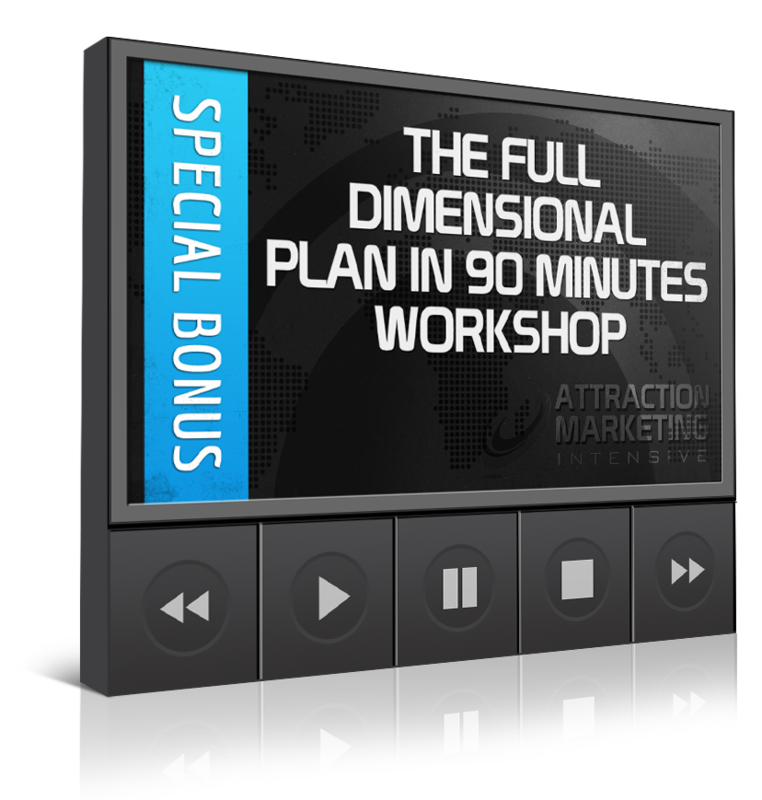 If you are ready NOW to take action and get results, I will see you inside the most PROFITABLE and FUN curriculum you will ever add to your digital training library: The recorded 8-Week "Attraction Marketing Intensive." Congratulations on your decision to finally Make it Happen because I know you are going to take action... and with ACTION comes RESULTS... and that feels good! Finally turn a profit with your business, and live the life you were promised when you said YES to this industry. P.S. - YES, you will have instant & LIFETIME ACCESS to this recorded training course. You can revisit the information as many times as you like, and it will be added to your digital training library forever. P.P.S. 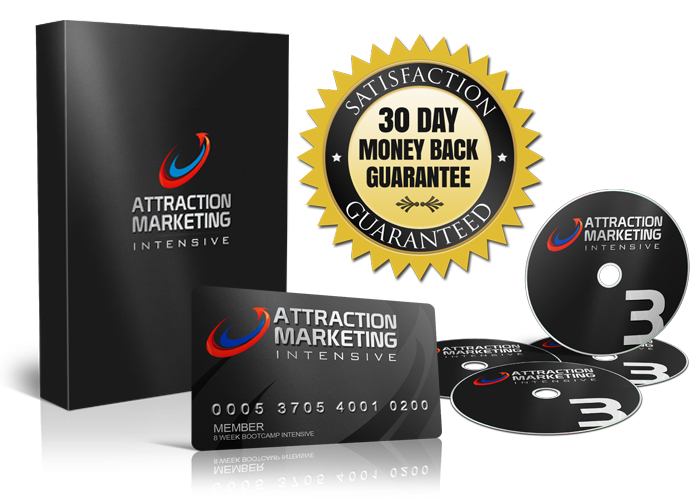 - There is a 100% 30-day 'no questions asked' money back guarantee on this training... Buy 'AMI,' apply what you learn over the next 30 days, and if you don't see results in 30 days we will give you your money back! I'm brand new, is this for me? YES! We will be showing you exactly how to leverage attraction marketing starting immediately so that you can build your business just like the pros from day 1. By week 8 you will have shaved months if not years off your learning curve, saved thousands of dollars in wasted ad spend, and well on your way to becoming the industry's next success story. I'm a seasoned vet, is this for me? How and when do I get the bonuses? Immediately when you Buy "AMI," you will get access to the ENTIRE 8-week course including all of the amazing bonuses (there is an additional unreal unadvertised bonus you will unlock when you buy today). Everything is INSTANT & LIFETIME ACCESS. The Bonuses, modules, and q&a sessions are yours to keep FOREVER inside your "AMI" members area! Absolutely not. I don't know if you're going to follow through 100% with your word and actually do the homework assignments I give you. However, IF you stick with me and do the work over the next 8 weeks, I can guarantee that your business will look drastically different than the one you have right now… and 6 months from today IF you stay the course, you could be at the top of your primary company receiving all the recognition (and money) that you have been dreaming about!